Garlic (Allium sativum) has had a long and rich history of both factual and mystical properties. It is one of the oldest cultivated crops and has been a staple in many diets. Garlic is rich in antioxidants and beneficial compounds that are considered to have positive health attributes. One of the best ways to enjoy a variety of garlic cultivars is to grow your own garlic. Garlic is easy to grow and, if grown properly, has very few pest and disease problems in the home garden. It requires little space and can be planted in the fall after many other crops have been harvested. Although there are many types of garlic, they can be classified into two broad categories: hardneck (Subspecies: ophioscorodon) and softneck (Subspecies: sativum). As seen in Table 1, each category has several groups with their own characteristics and advantages. Hardneck garlic is more closely related to wild garlic and typically has four to twelve cloves around a center flowering stalk. 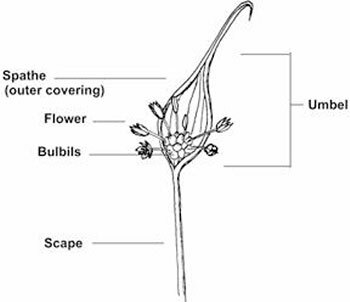 The hardneck stalk, known as a scape, is topped by a capsule referred to as an umbel that contains small aerial cloves called bulbils. Hardneck garlic is more flavorful and the cloves can be peeled from the skin more easily. The edible hardneck scape provides a milder taste in advance of harvesting the bulbs. For all these reasons, hardneck garlic is favored by gourmet chefs. Softneck garlic does not produce a flower stalk and typically has more cloves per bulb since all the energy goes to produce the bulb rather than the bulb and the flower stalk. Softneck garlic is easier to grow and typically has ten to forty cloves arranged in multiple layers. It can be braided and generally has a longer shelf life than the hardneck variety—six to eight months as compared with hardneck's two to four months. Softneck garlic is more likely to be what you find in the supermarket. There are many cultivars within each garlic group that grow well in New Jersey. Some examples of hardneck garlic that grow well in our area are Rocambole cultivars Killarney Red and Spanish Roja, Purple Stripe cultivars Chesnock Red and Metechi, and Porcelain cultivars Music and German White. Some examples of softneck garlic that grow well in New Jersey are Artichoke cultivars Inchellium Red and Lorz Italian and Silverskin cultivars French Red and Rose Du Var. Growing garlic takes a bit of patience. For best results, garlic needs nine months to mature. In New Jersey, it is best planted in October, (three to eight weeks before the first frost) for a June/July harvest the following year. Planting stock should be stored at 50°F and 60% relative humidity before planting. Garlic requires a period of cold followed by a period of light and heat to reach harvestable size. Select a sunny or partially shady location to plant your garlic. Soil conditions are important to proper growth and development of the bulbs. Good soil drainage is essential for good garlic production. One way to improve the drainage is by creating raised beds before planting. Soil pH between 6.5 and 7.0 is ideal. Garlic prefers light, well-drained soil to reduce the number irregularly shaped bulbs. Heavy clay and extremely light sandy soils can be improved by adding organic matter (i.e., compost, peat, or humus) to and mixing thoroughly with the existing soil. Hardneck Garlic Scape amd Umbel. The Herb Society of America. "Garlic: An Herb Society of America Guide." Start with healthy, firm, unblemished cloves. In general, the larger the clove, the larger the resulting bulb. It is recommended to purchase cloves from a reputable source such as a seed catalog or local garden center, in order to get named varieties that are disease-free and best suited for the growing region. Do not use supermarket garlic for planting stock since they may not grow in this part of the country and are treated to prevent sprouting. Sample a few varieties to determine what works best in your garden. Separate the cloves just before planting by carefully peeling the outer papery skin and removing the cloves from the base of the bulb, keeping the individual wrapper (tunic) and scab end (basal plate) intact. Plant the cloves 1–2 inches deep with the pointed side up. Space the cloves 3–6 inches apart in rows and 9–24 inches between rows. One clove will yield one bulb. When planted properly, less density yields larger, healthier bulbs since it allows for more sunlight and air circulation. Add pesticide-free grass clippings or straw mulch to cover and protect the planted cloves from winter frost and heaving. A fluffy layer of fresh grass clippings about three to four inches deep is ideal. The mulch can be kept in place through the spring to conserve moisture and suppress weeds. Grass clippings also provide a needed source of nitrogen as it decomposes. Remove the mulch in the spring, leaving just enough to suppress weeds. Garlic requires about an inch of water a week (similar to other garden vegetables) during the spring vegetative growth period. Garlic can tolerate nutrient poor soil as compared with other garden vegetables, but benefits from fertile soil with the addition of organic matter such as compost or aged manure prior to planting. A soil test can help determine if additional nutrients are necessary. If no soil test results are available, composted manure may be added prior to planting, or apply nitrogen (1 lbs/1000 ft2), phosphorus (3–4 lbs/1000 ft2) and potassium (2 lbs/1000 ft2) prior to planting. In the spring, additional nitrogen (1 lbs/1000 ft2) can be applied when the plants are 6–8 inches tall. Alternatively, foliar feeding done every two weeks from mid-March to mid-May may be beneficial. Feeding works best when applied a day or two after irrigation or a rainfall. Spray the leaves with a combination of 1–2% fish solution and .5% kelp. Stop watering the plants about a month before harvesting (when the leaves begin to yellow) to keep the papery skin dry and prevent the bulbs from rotting or splitting. Weeds are a major concern when growing garlic. Fewer weeds appear in the spring if the seed bed was properly prepared. Hand hoeing in the spring as weeds emerge is critical for good garlic production. Start weeding when the weeds are no more than one inch tall. Garlic can be harvested in three forms: scapes, green and bulb. In spring, hardneck garlic produces a scape. There are differing opinions about whether to cut off the scape. Most growers prefer to remove the scape to allow the plant to focus its energy on the bulb. The scapes can be cut off shortly after the flower stalk curls. Harvested scapes can be used in cooking to provide a garlic tasting green similar to scallions. When garlic is harvested before full maturity, it is referred to as green garlic. It can be used like green onions in salads or cooking. Bulbs are ready to harvest when the leaves begin to yellow or brown, plants start to fall over, and there is still 50% green leaves on the plant. Green leaves indicate that the bulbs are still intact and have not begun to break apart. Harvest bulbs preferably on a sunny, dry day. 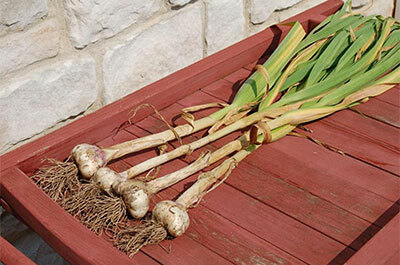 Do not leave the freshly harvested bulbs in direct sun for more than a few minutes to avoid sunburn on the garlic. Softnecks are harvested earlier than hardnecks since they generally mature faster. Carefully loosen the soil around the bulbs to minimize damage. The preference is to dig up the bulbs rather than pull them out. Shake off the excess soil, keeping the wrapper intact. By having more of the wrapper intact, the garlic will store longer. Do not wash the bulbs, as that may encourage the growth of fungus. Curing the harvested garlic will extend the shelf life of the bulb and strengthen its flavor. To cure, tie the garlic in bunches and hang in a shady, dry, cool and well-ventilated location for 4–6 weeks. Once the garlic is dry, trim the roots but retain the outer skin. Brush off any loose soil and trim the stalks about 1½ inches above the bulb. Store bulbs for eating at 32°F–35°F with 65–70% relative humidity, such as in the refrigerator vegetable bin. While garlic may be stored at room temperature, these temperatures may cause sprouting of the bulbs, so storage life may be shortened. Although garlic is less susceptible to insects and diseases than most vegetative plants due to its natural resistance (primary compound Allicin), some possible insect problems are onion thrips, onion maggots, mites, armyworms, and wireworms. Some possible diseases are skin blotch, white rot, basal rot, pink rot, and viruses. Insect and disease problems can be minimized by selecting healthy planting stock, proper growing conditions, adequate crop rotation, and good sanitation practices. A minimum three-year crop rotation is advised. Never plant garlic in an area where onion and/or garlic have recently been grown and always discard, rather than compost, garlic wrappers and plant materials after harvesting. Aaron, Chester. "Garlic: A Growing Guide." Organic Gardening Magazine Online. organicgardening.com/learn-and-grow/garlic-growing-guide. Accessed September 8, 2013. Engeland, Ron L. Growing Great Garlic. Okanogan, WA: Filaree Productions, 1991. Meredith, Ted Jordan. The Complete Book of Garlic. Portland, OR: Timber Press, 2008. The Herb Society of America. "Garlic: An Herb Society of America Guide." herbsociety.org/factsheets/Garlic%20Guide.pdf. University of Minnesota Extension. "Vegetable Crop Management, Growing Garlic in Minnesota." extension.umn.edu/distribution/cropsystems/dc7317.html.